10 inch Metallic Silver Stretch Loops available in 5 or 10 Loops. 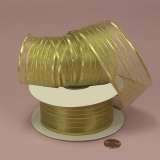 10 inch Metallic Gold Stretch Loops available in 5 or 10 Loops. Twine is the new "HOT" product! Available in 5, 10 or 25 yds. 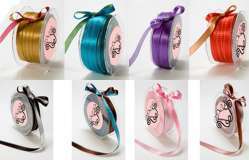 Celebrate the arrival of a wee one with the Baby Ribbon. Perfect for baby shower favors and invitations with a Metallic pink for a precious baby girl or a metallic blue for a precious little boy. 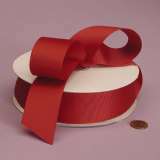 This 3/8 inch width polyester American-made ribbon is sure to elicit oooohs and aaaaaahs. 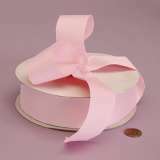 Use the Baby Ribbon for favors, decorations, place cards and announcements. 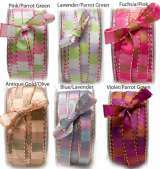 delightful packaging wrap for the newborns in your life or a baby card for new parents. 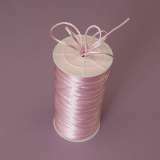 Available in Metallic Pink and Metallic Blue in lengths of 5 and 25 yds. 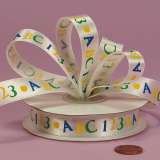 Fun multi colored striped 3/8 ribbon, One color on one side with a different color on the other side. Only the red/green is shown here but there is also a red/white ribbon available...both are PERFECT for Christmas designs! Available in 4, 10, and 25Yards. Adding a modern twist to the traditional check. Add a fun touch to your next design! 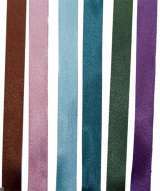 3/8 Satin ribbon available in Copper, Azalea, Caribbean Blue, Teal, Hunter Green, and Plum available in lengths of 5 and 25 yds. 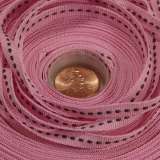 Add some dimension to any design with this 3/8 Woven Diamonds in either brown or pink in 5 or 25 yd lengths. 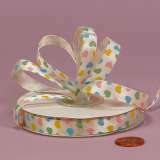 Colorful, fun, quirky and cute, the 3/8 Dippy Dots ribbon is a polyester grosgrain print just perfect for the creatively-minded. Use the Dippy Dots ribbon whenever you’re in a particularly expressive mood. Available in lengths of 5 and 25yd . 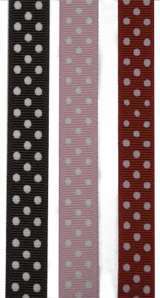 An all-over pin dot pattern makes the Swiss Dots grosgrain ribbon a designer favorite. Use the Swiss Dots ribbon to fashion charming bows and whenever a classic dotted accent is just the right choice for your paper design. 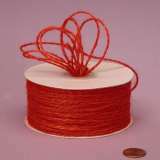 Available in lengths of 5 and 25 yds. Available in 4, 10, or 25 yds. 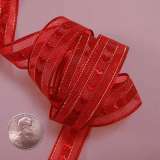 Perfect ribbon to use to accent any design. 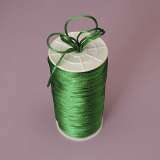 Available in forest green, red, lemon, brown, purple, mint, white, ivory, and pink in lengths of 5 and 25 yds. in lengths of 5 and 25 yds. Use it for invitations, scrapbooking, hair bows, and papercrafts. This ribbon has the most luxurious feel. Available in 4, 10, and 25 yds. Nothing will make your project stand out more than a sheer ribbon with a bold satin edge; Decadent Dancer ribbon is the perfect choice. 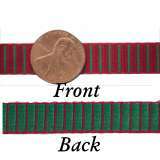 This American-made polyester ribbon is noted for its luxurious look and feel. 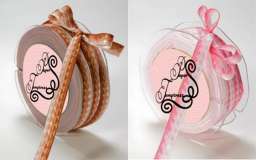 Use the Dancer ribbon as an all occasion staple, just perfect for so many of your paper designs. Available in Diamond Blue, Chamois, Moss NO LONGER AVAILABLE, Yellow Gold, Red, Orange, and Antique Gold. 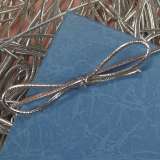 Understated elegance is often the impression which most needs to be conveyed; the Opulence ribbon with its monofilament edge and striking highlights is the perfect choice for discerning designers. 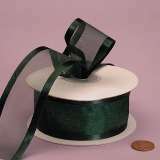 This American-made polyester sheer ribbon in the 5/8 inch width uses metallic thread highlights in a delicate stripe to invoke a quiet sense of elegance. 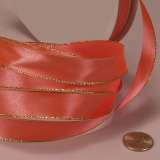 Use the Opulence ribbon whenever the need to pursue luxuriousness is at the top of your agenda. 3 striking colors: Black, Gold, and Iridescent. 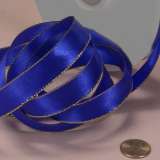 Perfect 5/8 feather edge ribbon to use to accent any design. Color with copics to coordinate with any colors. 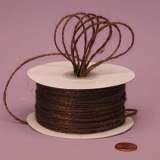 Available in lengths of 5 and 25 yds. 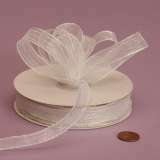 This elegant sheer 5/8 delight ribbon will compliment any paper design! The radiating fluted pattern of shells is creatively captured in the scalloped edges of the 5/8 Kendra ribbon. 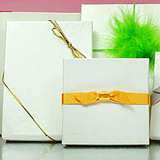 Use the Kendra ribbon on gift boxes, gift bags, craft projects and more. 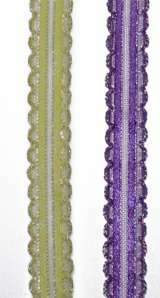 Available in Purple/Opal and Yellow/Opal in 5 and 25 yd lengths. 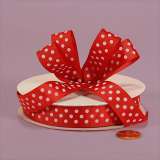 This ribbon is AMAZING, the picture doesn't do it any justice, trust me on this one! 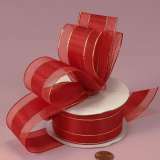 5/8 Brown/Aqua and Pink/Brown satin ribbons cut in 5 yard lengths. Fun fun fun ribbon!! Made in the USA! 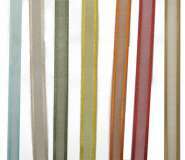 Without a doubt one of the most popular stripes ever created, the Rainbow Stripe grosgrain ribbon remains a favorite. Six bold and expressive bands of colors ranging from blue to vibrant red capture the eye and focus attention upon your designs. Available in lengths of 5 and 25yds. A stunning blend of solid and sheer, the Garbo ribbon brings a touch of refined elegance to any project. 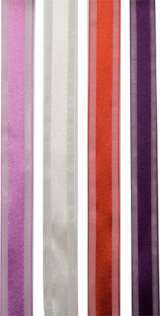 4 vibrant colors Spring Orchid, Red, Ivory and Eggplant. 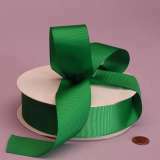 Two two two ribbons in one :) Textured grosgrain and smooth satin! 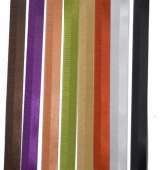 Available in brown, plum, cantaloupe, citron, golden apricot, white, and black in lengths of 5 and 25 yd. 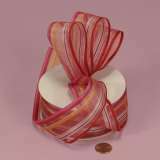 An asymmetrical beauty, the Westbrook Stripe ribbon combines stripes of varying widths with a set of complementary colors to achieve an eye-catching preppy fashion look. 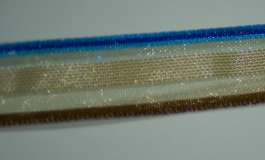 Available in Pink/Brown and Blue/Brown in lengths of 5 or 25 yds. 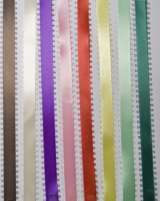 A distinctive banded ribbon, the Opulence pattern adds a new dimension to the sheer ribbon category. With the sheen offered by a polyester/nylon weave and bold stripes against a sheer backdrop, this ribbon stands out as a classic. 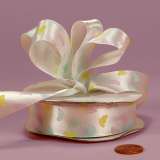 Use the Opulence ribbon to fashion amazing bows that will bring a strong sense of vitality to any paper design. 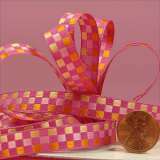 This ribbon is PERFECT for gift wrapping! I used it on all my Christmas gifts. 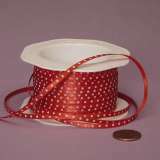 Like a fresh sprinkling of tiny white blossoms, the Confetti Dots Grosgrain ribbon magically enchants. A symmetrical scattering of perfectly sized dots awash on a field of color make this printed polyester ribbon an eye-pleasing favorite. 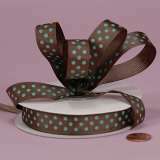 Use the 5/8 Confetti Dots ribbon in paper designs, as gift wrap or for hot and trendy accessories. Available in brown, pink, and red.